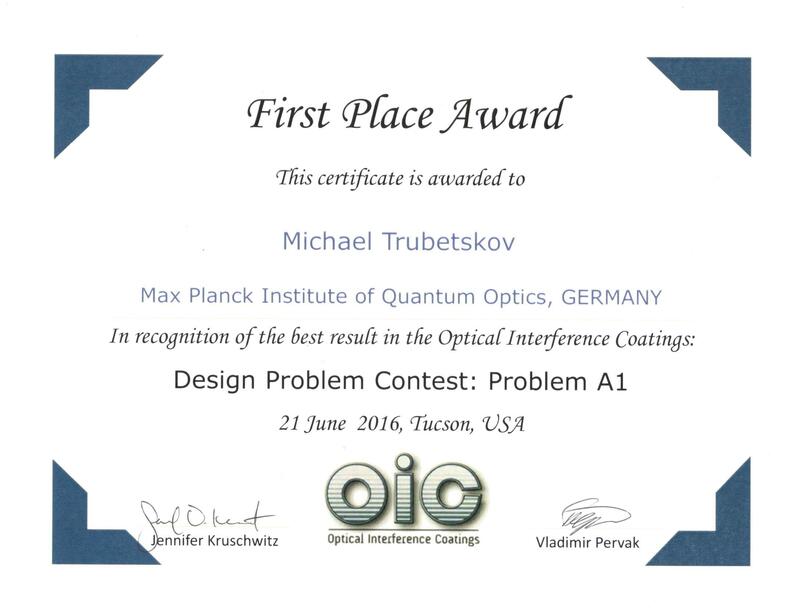 OptiLayer allows solving the most complicated design problems. 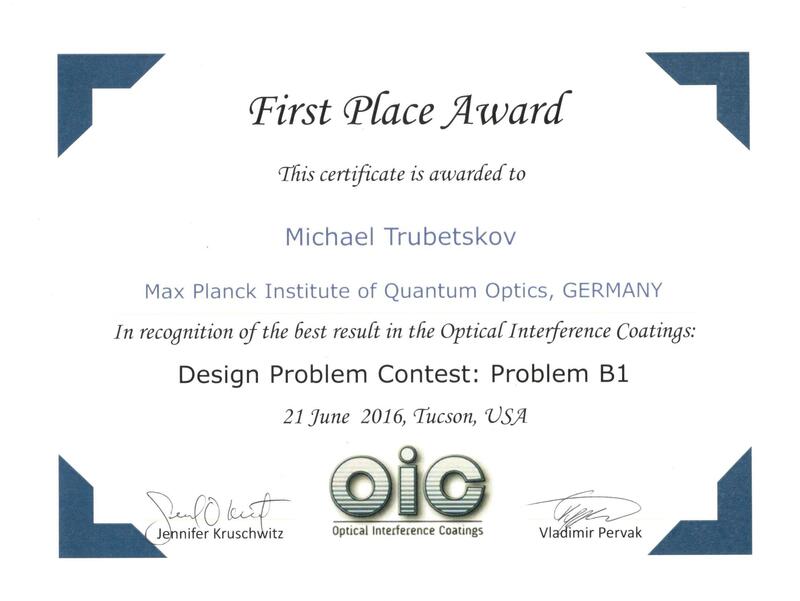 Design contests are held in conjunction with the Optical Interference Coatings (OIC) topical meetings of OSA. 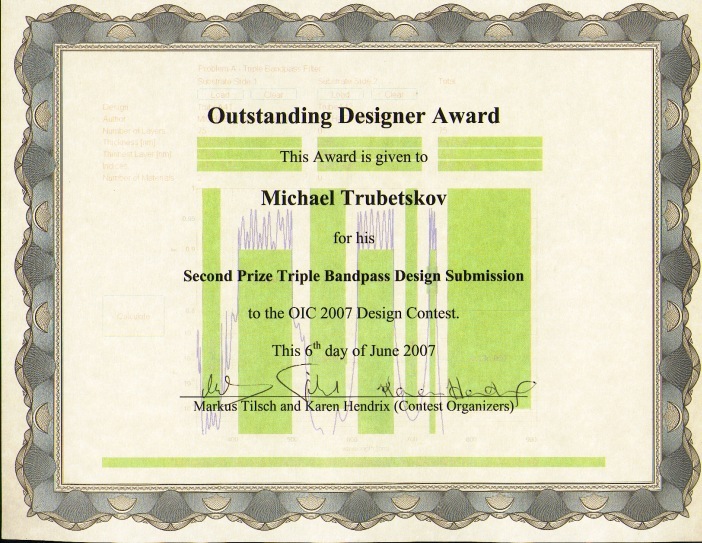 Winning designs were obtained by OptiLayer software. The first problem was a dispersive mirror. 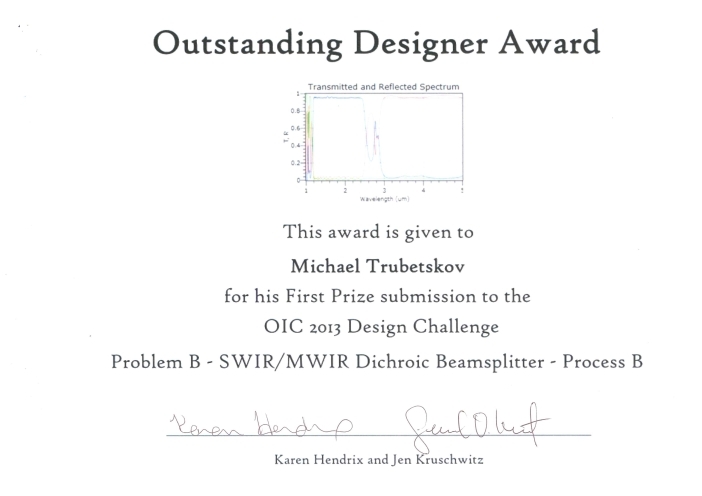 This goal was to check the limit of available design capability and to design a dispersive mirror with as large as possible GDD in wavelength range from 700 nm to 900 nm. This is the wavelength range of Ti:Sapphire,which is widely used in femtosecond optics. The second problem was a combination of Cissoid of Diocles [cubic plane] reflectance curves, pointing upward and downward, over the visible wavelength range. The reflectance ranges from 20% to 80% at the minimums and maximums respectively. 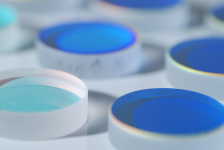 This problem requires matching the spectral reflectance curve directly and then find the most efficient design to address a non-uniform deposition process for a series of optics in a rack. 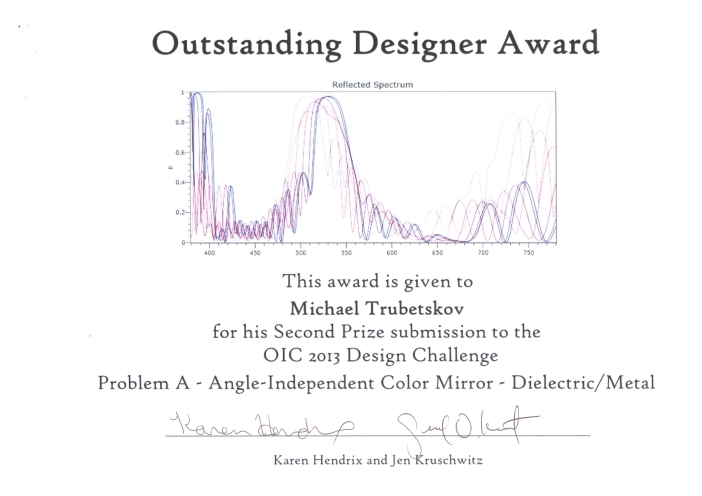 The design problems involved a new perspective on traditional color mirrors and a wavefront sensitive application that designers face regularly. The first problem is a color mirror that maintains the same perceived specular reflected color, under specific illumination, for a broad range of incident angles. Also, the color required is highly chromatic, which in some situations would fall outside of the color gamut for many naturally colored objects. Special OptiLayer options allow solving such problems. The winners of the first problem are Michael Trubetskov and Weidong Shen. The second problem is a high performance dichroic beamsplitter for the SWIR and MWIR wavelength region that must maintain its optical flatness after coating. 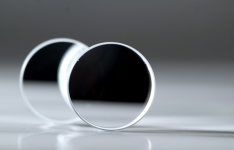 In addition to optical constants, Young's modulus and Poisson's ratio are provided for the candidate coating materials and the designer must select materials that allow the spectral and optical figure requirements to be met. 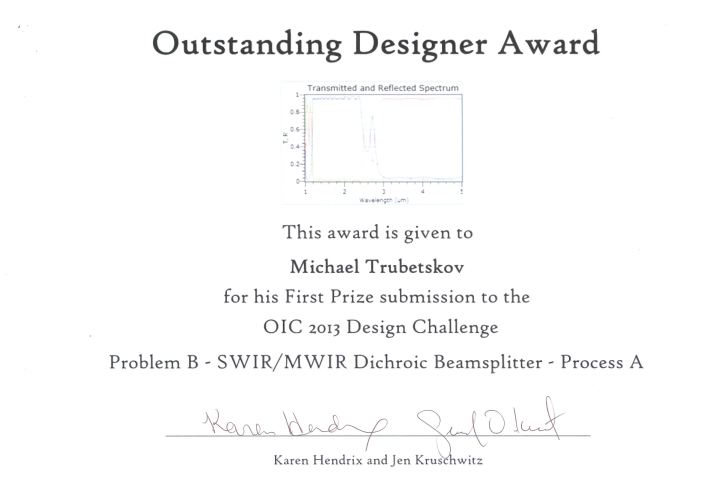 The winner of the second problem is Michael Trubetskov. The detailed description of the problems, design techniques, obtained solutions will be described in the special issue of Applied Optics. 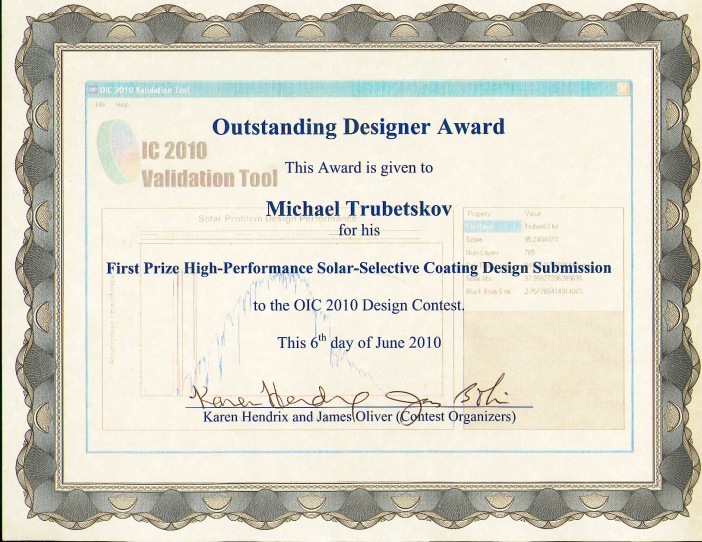 Two design problems were considered: a high-temperature solar-selective coating, and a near to mid-infrared Fabry–Perot etalon. 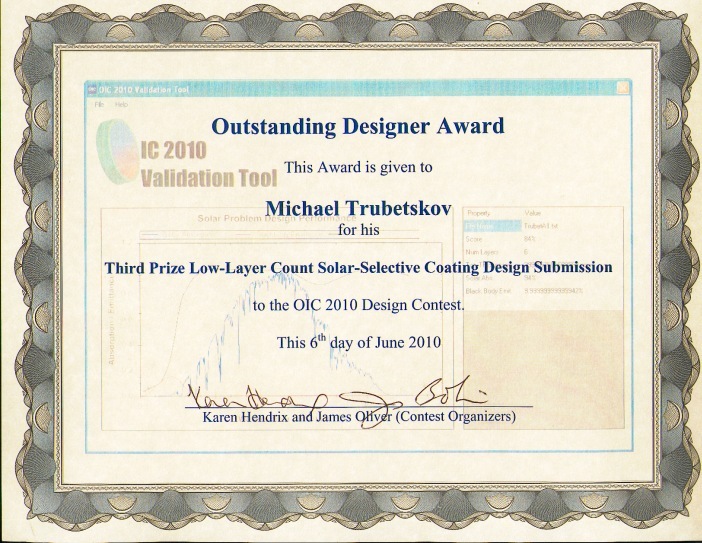 The winners of the first problem are Michael Trubetskov and Fabien Lemarchand (the design with the highest overall merit function, and the fewest layer/thinnest solar-selective design). 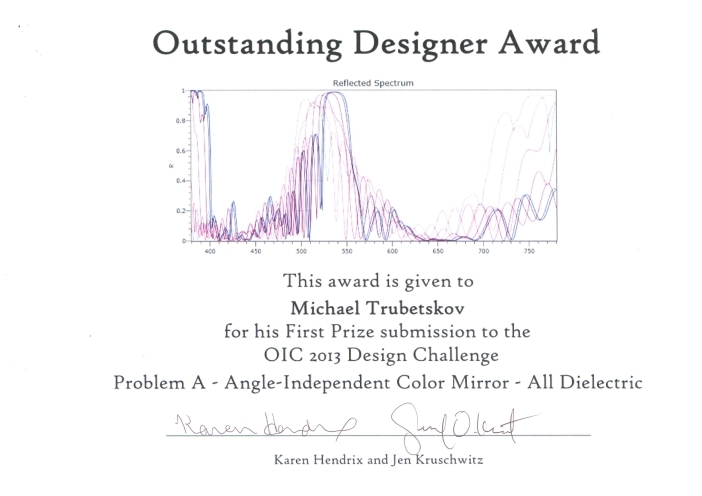 The winner of the second problem is Michael Trubetskov (the thinnest Fabry–Perot etalon design with a free spectral range standard deviation of 0). The second places : Vladimir Pervak and Bill Southwel. 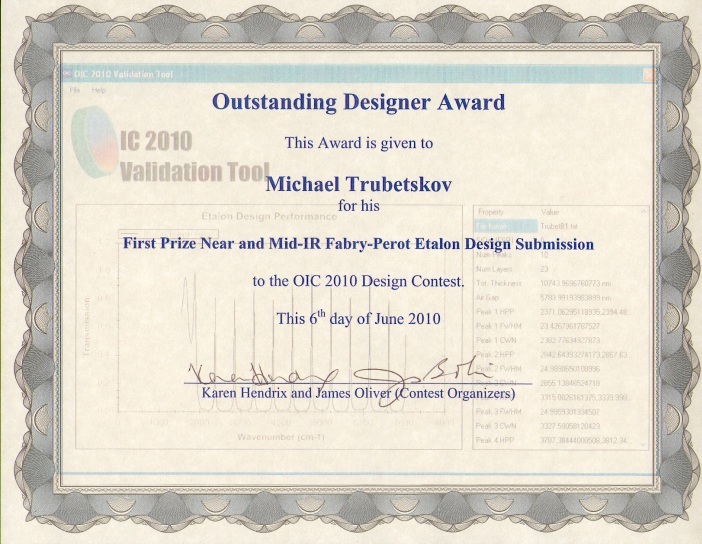 The design techniques and design solutions are described and evaluated in the corresponding paper. A triple bandpass filter and a nonpolarizing beam splitter were designed. The winners are Fabien Lemarchand, Michael Trubetskov and Vladimir Pervak. The details of design problems, design approaches and evaluations of solutions are published in the following paper. 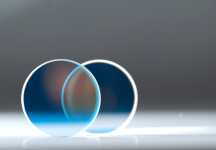 Design problems of a manufacturable, broadband, wide-angle antireflection coating for the visible spectral range and a minimum-shift immersed short-pass filter were solved. The winners of the first problem are Gary DeBell, Michael Trubetskov and Tatiana Amotchkina. The second problem was won by Fabien Lemaschand, Michael Trubetskov and Tatiana Amotchkina. The submitted designs are described and evaluated in the special paper. wavelength-division multiplex (DWDM) filters for low group-delay GD variation were proposed. 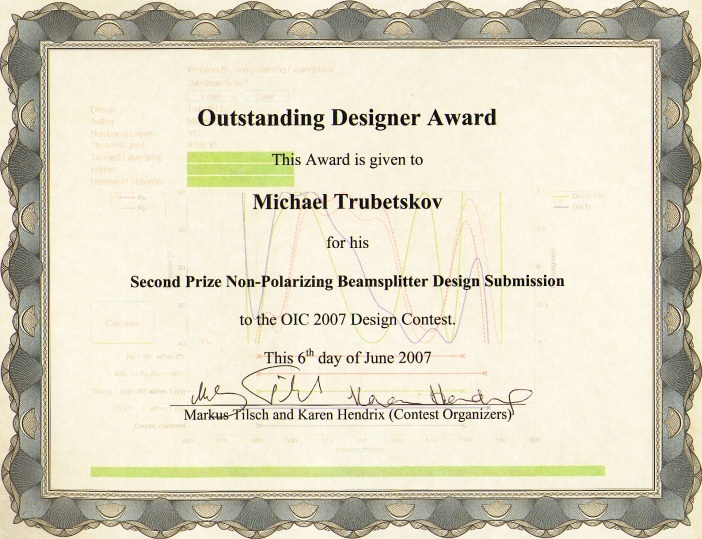 Results of the contest are given, evaluated and discussed in the corresponding paper.